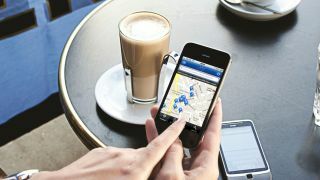 Faster mobile broadband in a coffee shop than at home? South Korea's leading mobile carrier, SK Telecom, is on the brink of releasing a mobile service that is four times faster than Long Term Evolution (LTE) that is currently available in the country. The company will bring forth a superfast 300 megabits per second mobile internet service in late 2014. Comparatively, regular LTE is can only achieve speeds of up to 75 Mbps and new LTE-Advanced (LTE-A) speeds of up to 150Mbps. Dubbed 'LTE-Advanced Band Carrier Aggregation', the South Korean network is twice as fast as LTE-Advanced speeds and around four times faster than regular LTE. This incredible speed is made possible because the technology aggregates two differing frequency bands to reduce interference. LTE-Advanced CA uses a 20MHz bandwidth in a 1.8GHz band and two 10Mh bandwidth in 800MHz. Park Jin-hyo, senior vice president and head of the R&D centre at SK Telecom, said in a statement: "With the successful development of 'LTE-Advanced CA,' SK Telecom further strengthens its global leadership in telecommunications technologies, SK Telecom will continue to make strenuous efforts to provide unmatched service quality and speeds, which will lead to the overall advancement of the global telecommunications industry." According to the company, a 300Mbps connection can download an 800MB film in just 22 seconds. It's worth bearing in mind though that these are test conditions, and it remains to be seen just how fast the network would be in the real world, having to face up to interference and server strains. SK Telecom will be demonstrating the technology at the MWC 2014 in Barcelona next month. Could there be a smartphone in the near future with this superfast mobile internet built in?